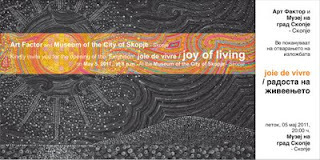 The project Joie De Vivre (Joy of Living) has the aim to stimulate and develop cooperation between artists in Skopje (Macedonia) and their fellow artists in Podgorica (Montenegro), as well as to present a part of the vibrant contemporary art scene in these two cities, thus presenting the cities of Skopje (Macedonia) and Podgorica (Montenegro) as culture centers in this part of the Balkans. 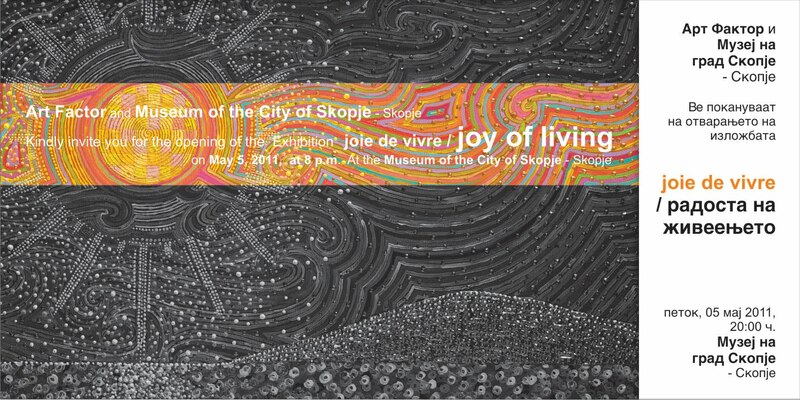 Artists from Macedonia: Ismet Ramicevic, Bedi Ibrahim, Dijana Tomic Radevska, Aleksandra Petrusevska, Goce Nanevski, Atanas Botev, Marija Sotirovska, Zoran Poposki, Slavica Janaslieva, and Nehat Beqiri. Artists from Montenegro: Tijana Dujević Liscevic, Natasa Djurovic, Tijana Gordic, Adin Rastoder, Darko Djurovic, Nada Kazhic, Marko Lukovac, Ilija Nikcevic, Milos Popovic Miki, and Zeljko Reljic.